WASHINGTON, D.C. -- More than four in five non-retired U.S. investors -- 85% -- strongly agree that it's important to have a guaranteed income stream in retirement to supplement Social Security. Yet, only 27% strongly agree they are willing to give up access to some of their money in order provide that guarantee. About twice as many investors, 50%, strongly agree they want the freedom to spend their retirement savings however they choose, even if that means prematurely running out of money. * = less than 0.5%. 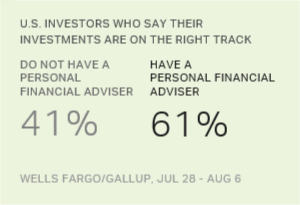 Overall, majorities of investors agree at least somewhat with both statements about managing their money in retirement. However, agreement is higher with the desire for freedom to choose how to spend one's retirement savings, with 75% of investors strongly or somewhat agreeing with this. Alternatively 61% strongly or somewhat agree they are willing to give up access to some money in order to provide for a guaranteed retirement income stream. Combining the two responses reveals three very different types of investors in terms of their financial mindset. Altogether 45% of investors agree with both statements, even though they are contradictory. Another 30% agree only that they want the freedom to spend their money however they choose. Sixteen percent agree only that they want a guaranteed income stream, even if they lose access to some of their money. Seven percent disagree with both statements. These findings are from the latest Wells Fargo/Gallup Investor and Retirement Optimism Index poll, conducted Nov. 1-5, 2017. Investors interviewed for the survey are U.S. adults 18 and older with at least $10,000 in stocks, bonds or mutual funds. Aside from Social Security, a variety of financial products are available that can provide a guaranteed income, ranging from annuities to bonds, CDs and treasury bills. All essentially lock away money in the present to receive a fixed payout or payouts in the future. In the same poll, non-retired investors were asked how much they agree with the statement "You are unsure about the different types of investments and annuities that can provide income throughout retirement." 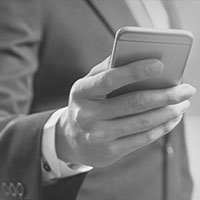 Roughly half (49%) strongly or somewhat agree with this, including 60% of investors with less than $100,000 in investments and 39% of those with $100,000 or more. At the same time, non-retired investors are sharply split in terms of wanting their employers to help them manage their investments to last throughout their retirement. About half (48%) agree they want their employer's help, including 22% who strongly agree. The other half (52%) disagree, including 26% who strongly disagree. Pensions can be a particularly valuable guaranteed income stream in retirement. However, having a pension depends on finding an employer who provides one, something that has become increasingly rare in the private sector. According to the survey, 61% of retired investors vs. 46% of non-retired investors have a pension. The broader societal shift away from pensions, also known as "defined benefit" plans, and toward 401(k)s, known as "defined contribution" plans, is evident in the percentages of investors reporting they have a 401(k) or 403(b) type plan. While three-quarters of all investors say they have such a plan, the rate is 63% among retired investors compared with 81% among non-retired investors. Additionally, 37% of retired investors and 21% of non-retired investors say they have an annuity. Do you have any of the following types of retirement plans? Non-retired investors broadly recognize the importance of having something more than Social Security in retirement to provide them a guaranteed income stream. However, the decline of pensions means employees may need to embrace financial products that will cost them up front. The survey doesn't ask investors specifically about their willingness to purchase annuities or use other fixed-income producing instruments such as bond ladders and treasury bills. However, the finding that many are reluctant to sacrifice autonomy over their money in exchange for retirement security may partially explain why use of annuities is fairly low. That, coupled with many investors' admission that they are uncertain about the different options for creating guaranteed income, as well as their reluctance to get advice from their employer, suggests the next generation of retirees should be turning to professional financial advisors for guidance on making their money last throughout retirement. 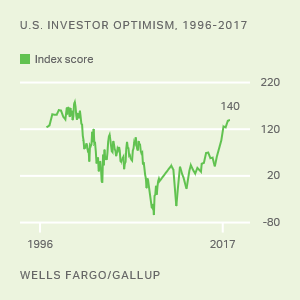 Results for this Wells Fargo/Gallup Investor Optimism and Retirement Index poll are based on telephone interviews conducted Nov. 1-5, 2017, on the Gallup U.S. Daily survey, with a random sample of 1,015 adults, aged 18 and older, living in all 50 U.S. states and the District of Columbia having investments of $10,000 or more. Learn more about how the Wells Fargo/Gallup Investor and Retirement Optimism Index poll works.